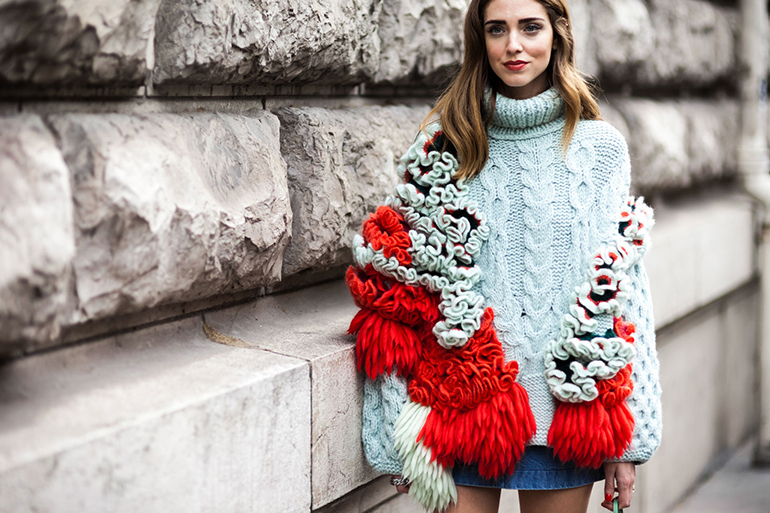 With only 28 years old the Italian blogger Chiara Ferragni has already marked her name on the fashion world. Along with the launch of her blog in 2009 – The Blonde Salad - came the international recognition when the NY Magazine introduced her as a roll model to follow when it comes to street style. Chiara Ferragni in Paris Fashion Week. Chiara Ferragni in Milan Fashion Week wearing Dita sunglasses available at CLERIGOS IN. Chiara Ferragni in Just Cavalli. In short time she was invited by fashion houses like Christian Dior, Louis Vuitton, Max Mara, Chanel among others and quickly presented her own brand revealing to be a world large success. Chiara Ferragni Capsule Collection – flirting tshirt. 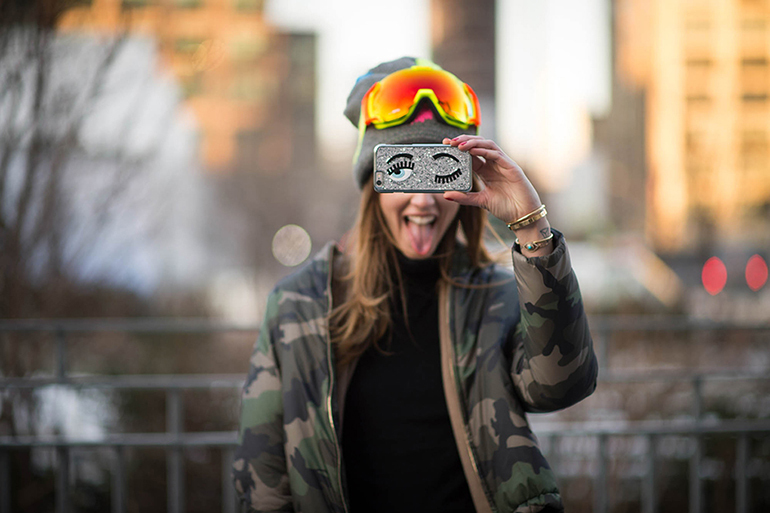 Chiara Ferragni Capsule Collection – flirting iphone cover. In the world of the social networks Chiara Ferragni has achieved more publicity and by that made her name even more known. At this moment her Instagram, @chiaraferragni, counts with more 3.6 millions of followers. 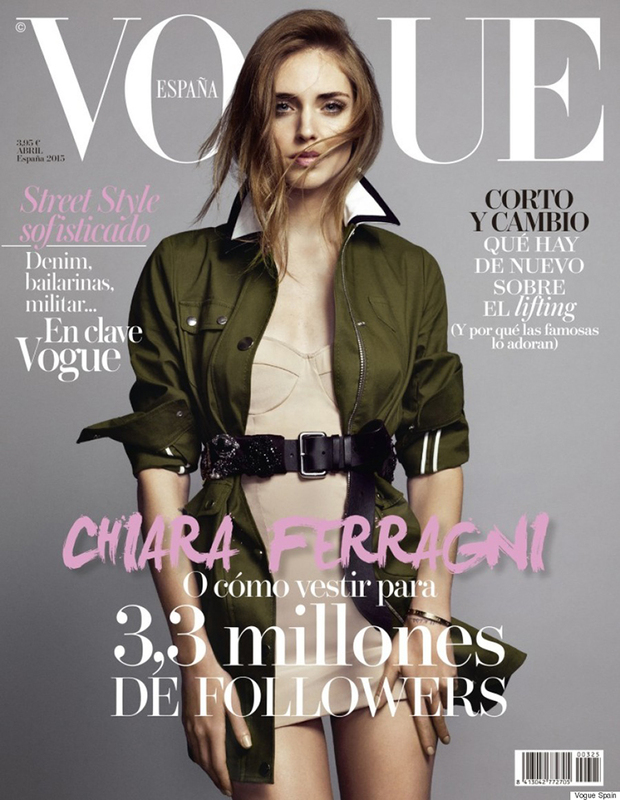 Chiara Ferragni cover for Vogue Spain. Chiara Ferragni with Miu Miu Sunglasses available at CLERIGOS IN. It is our pleasure to present exclusively in the Invicta’s (unbeaten) Oporto city the Chiara Ferragni’s collection that makes us sigh and dream about what will be the next adventure our feet will be walking on. Shall we walk around with popcorn or hamburgers? Lets shine? We can also wear the backpack and blink an eye for those who admire our good taste! How about you? Will you want to walk around blinking an eye? Com apenas 28 anos, a blogger italiana Chiara Ferragni, já se tornou um exemplo de moda e bom gosto no mundo. Com o lançamento do seu blog – The Blonde Salad – em 2009, depressa foi reconhecida e apresentada pela conceituada revista NY Magazine, como um ícone do street style a seguir. Requisitada em pouco tempo por casas como Christian Dior, Louis Vuitton, Max Mara, Chanel, entre outras, rapidamente lançou a sua própria marca, que se tem traduzido num sucesso a larga escala. No mundo das redes sociais, Chiara Ferragni, conseguiu mais publicidade, e assim, evidenciar ainda mais o seu nome. Hoje, por exemplo, o seu Instagram @chiaraferragni já conta com 3.6 milhões de seguidores. É com prazer que vos damos a conhecer, em exclusivo na cidade invicta do Porto, a colecção da Chiara Ferragni, que nos faz suspirar e desejar pela próxima aventura que os nossos pés vão poder passear. Vamos com pipocas ou hambúrgueres? Vamos a brilhar? Podemos levar a mochila, e piscar o olho para quem nos admirar o bom gosto! E vocês? Vão querer andar a piscar o olho por aí?